Route along part of the beach of Las Marinas, continuing to the harbour area and to the North Jetty. On the wooden walkway onto the beach and on the sidewalks cyclists have to respect the pedestrians and therefore slow down (10 km/h). PAVEMENT: Wooden planks on the walkway on the beach and dunes, sand, earth and asphalt/concrete on the sidewalks of Las Marinas and on the north harbor arm. No motorized vehicles allowed on the wooden walkways on the beach and on the last part of the North Jetty. SUITABILITY: This route is suitable for people in wheelchairs on the wooden walkways and the sidewalks of Las Marinas. Bassetes Park or roundabout at the Benidorm square from the direction of the city. Enjoyable walk and ride along the wooden walkway on the beach with newly planted vegetation on the dunes. Park LES BASSETES : A green area of 26.000 m2 near the beach. with picnic tables, open air theatre, skate rink, swings, equipment for gymnastics, a bar and toilets. 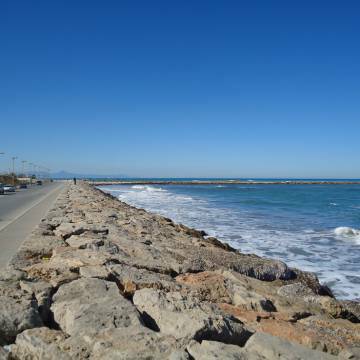 NORTH JETTY : The lighthouse at the end of the north harbour arm gives a magnificent outlook over the harbour and the coastline of the Golf of Valencia with the coastal mountain ranges. You also see Denia Castle, the rocky coastline of Las Rotas, the high cliff of Cabo de Sant Antonio and the shape of the Montgo, reminding us of a sleeping elephant. Comings and goings of the various ferries and also the beautiful morning glows over the ocean as well as the sun going down behind the mountains.